Gold/polymer nanocomposites by dispersed phase polymerisation using ultrasonic initiation and agitation. The miniemulsion polymerisation of methyl methacrylate is initiated using an ultrasonic field at 25oC and in the absence of added hydrophobe. A latex with a particle size of ~70 nm diameter is produced with a conversion of 80% in around 80 min of sonication. Gold nanoparticles synthesised either by sonochemical or chemical reduction may be successfully incorporated into these particles during polymerisation. Miniemulsion polymerisations typically make use of ultrasonic irradiation to disperse the monomer into fine droplets (~100 nm) in the aqueous phase. These droplets are usually stabilized against coalescence with a surfactant and against Ostwald ripening through the addition of a hydrophobe such as hexadecane. Recently described techniques for the synthesis of both cationically and anionically stabilized latexes have been used to study the effect of ultrasound on both the initiation and agitation of the monomer/polymer system.1,2 In this case, miniemulsion-like polymerisation is observed in the absence of added hydrophobe and initiator. A typical reaction includes MMA (6.4 g), SDS (0.46 g) and water (36 g) and is polymerised in a jacketed reactor held at 25oC. Polymerisation is initiated by H· and OH· radicals generated during ultrasonic cavitation using a 20 kHz ultrasonic field at 26 W (nom.). A typical conversion/time curve is shown in Figure 1. 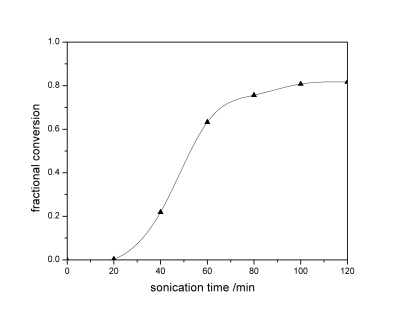 Figure 1: Conversion vs time for the miniemulsion polymerisation of MMA at 25oC. Gold nanoparticles (~10nm in size, such as those shown in Figure 2a) were synthesised using either sonochemical3 or chemical reduction methods.4,5 The mixture of gold nanoparticles and monomer was then used in the miniemulsion polymerisation process as described above, producing gold/polymer nanocomposite particles (Au@pMMA), such as that shown in Figure 2b. 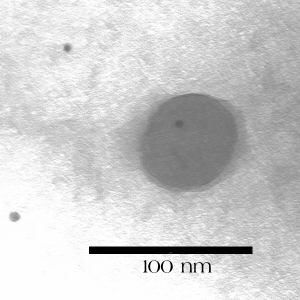 Figure 2: (a) Gold particles produced by chemical reduction ~10 nm in diameter. 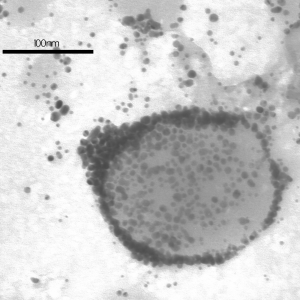 (b) Gold particle embedded within a poly(MMA) particle. The mechanisms by which these miniemulsion polymerisation proceed will also be described, including the sensitivity of the system to the reaction temperature. The Particulate Fluids Processing Centre is established and supported under the Australian Research Council's Research Centres Programme. 1. M.A. Bradley and F. Grieser, Journal of Colloid & Interface Science 251, 78 (2002). 2. M.A. Bradley, M. Ashokkumar, and F. Grieser, Journal of the American Chemical Society 125, 525 (2003). 3. R.A. Caruso, M. Ashokkumar, and F. Grieser, Langmuir 18, 7831 (2002). 4. M. Brust, D. Bethell, D.J. Schiffrin, and C.J. Kiely, Advanced Materials 7, 795 (1995). 5. D.I. Gittins and F. Caruso, Angewandte Chemie International Edition 40, 3001 (2001).